Do you want to double your winnings? No problem! Make a deposit and get twice as much money on your account. Play and win in your favorite games right now! The bonus is available for activation within 5 days since the moment it appears in your personal account. In case of deactivation of the bonus, all bonus money is debited from your account. The balance will equal your actual deposit amount or less, if some money was spent. 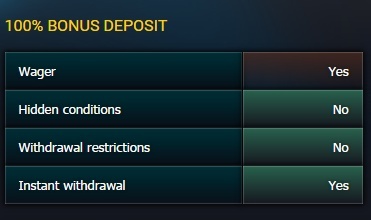 While the “100% bonus deposit” is active, the bets turnover applies only to winning back the wager (x35). In case the bonus is deactivated, your turnover to the real deposit will equal zero.